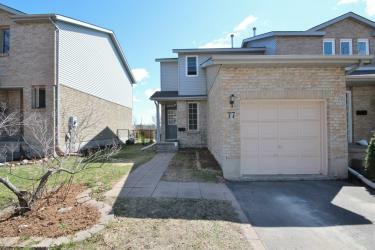 seeing is believing and you wont want to miss this beautifully updated three bedroom, freehold end unit town home that is ready for its new home owners, located in popular grenadier village which provides ease of access to schools, bus, shopping, trails and cfb kingston. main level offers powder room, family room complimented by brand new dark laminate flooring and large eat-in kitchen great for entertaining/family with brand new click flooring. upstairs offers an over sized master with walk-in closet, full bath with surround tub and shower, 2 generous sized additional bedrooms and brand new berber carpet throughout, which continues down to the lower level where you can find an additional and large recreation space along with over sized laundry and storage area. this home is a pleasure to show and complete with freshly painted neutral tones throughout!